Why is the American Silver Eagle one of the most collected coins in the world? Is it because of its United States provenance and guaranteed silver purity? Or maybe it's due to its 33 years of history, originating in the Reagan administration as a way to spur private silver ownership? Perhaps it’s a result of the coin's stunning combination of Adolph A. Weinman's classic Walking Liberty with John Mercanti's heraldic eagle? There's only one clear answer: it's because of all of those reasons – and more! 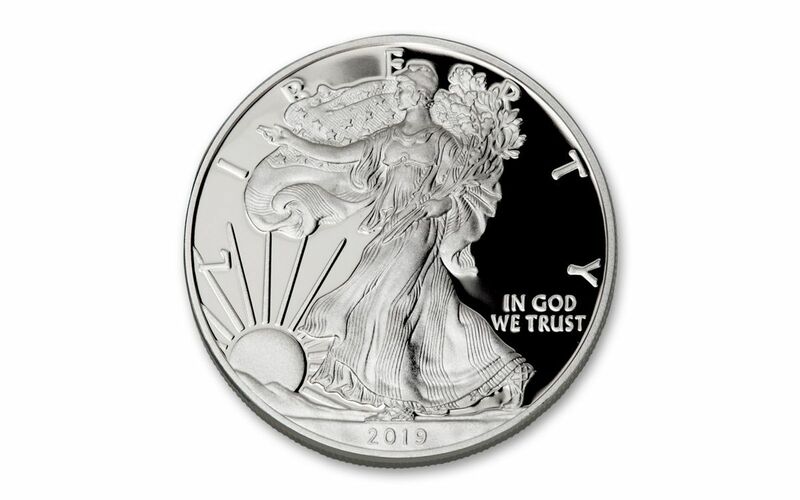 No matter why you love collecting American Silver Eagles or how you've come to appreciate them, we have the 2019 Silver Eagles that are right and ready for your collection. Whether you love them for their art or for their metal (or both!) we have a special offering of this classic beauty struck at the U.S. Mint’s branch mint at West Point and graded by Numismatic Guaranty Corporation (NGC) as being in perfect Proof-70 (PF70) condition. In addition, your coin will also be certified as a First Releases (FR) coin by NGC, meaning that it was among the first struck by the mint and was verified within the first 30 days of issue. Collectors seek out these coins because they are produced with new dies and considered to have sharper strikes and deeper mirrors than those that are struck later. Also, the population of coins labeled First Releases is only a fraction of the total mintage. It will come sonically sealed in an acrylic holder with an exclusive label that shows a portrait of the designer of the Walking Liberty, Adolph A. Weinman.
. . . PAIRED WITH JOHN MERCANTI'S HERALDIC EAGLE! – This coin's stoic and symbolic heraldic eagle was created by designer John Mercanti -- the most prolific coin and medal designer in United States Mint history! EXPERTLY STRUCK IN HIGHLY PURE SILVER – The craftspeople of the West Point Mint are known around the world for their skill and attention to detail. It's this talent that transforms each one-ounce planchet of 99.9% fine silver into beautiful pieces of numismatic art. 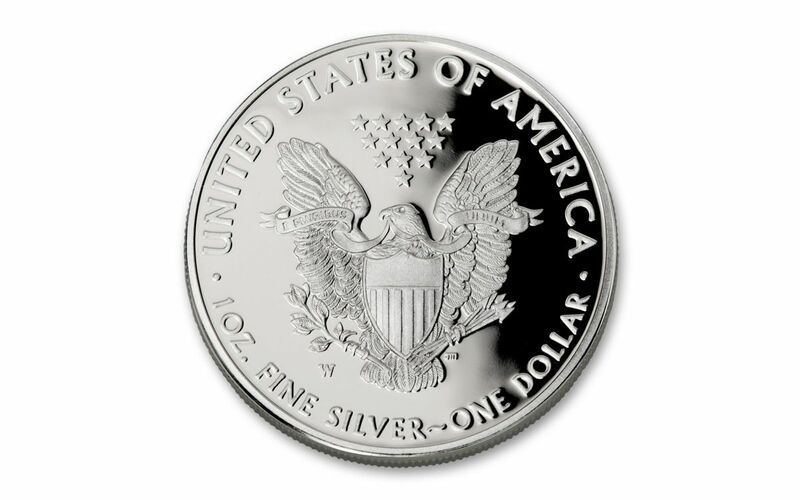 U.S. LEGAL TENDER – Each 2019 American Silver Eagle is one dollar United States of America legal tender, as seen on the coin's reverse. 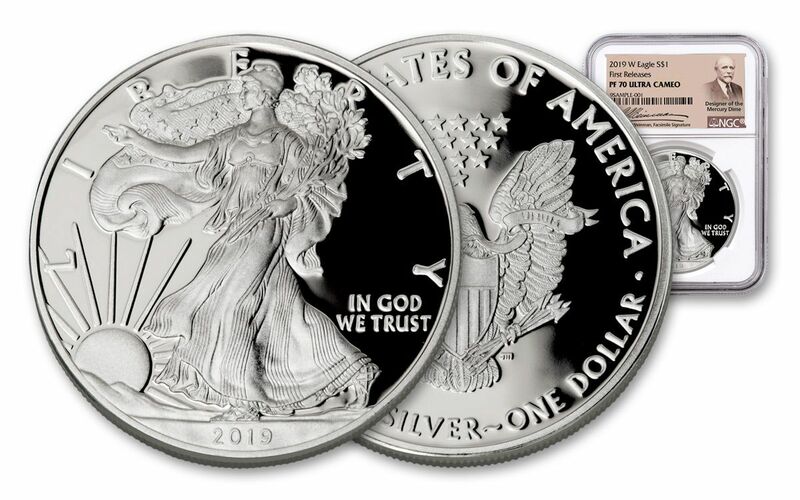 BEAUTIFUL PERFECT CONDITION – Your 2019 One-Ounce Silver Eagle will arrive to you in Proof-70 (PF70) condition, a distinction that means your perfectly-graded coin will have ZERO imperfections – showing all features and fields exactly as the engraver and mint intended! KEY FIRST RELEASES CERTIFICATION – Your coin will also be certified as a First Releases (FR) coin by NGC, meaning that it was among the first struck by the mint and was verified within the first 30 days of issue. It will come sonically sealed in an acrylic holder with an exclusive label that shows a portrait of Adolph A. Weinman. Silver Eagles like these are perennial favorites, usually flying out of our vaults as soon as they arrive! 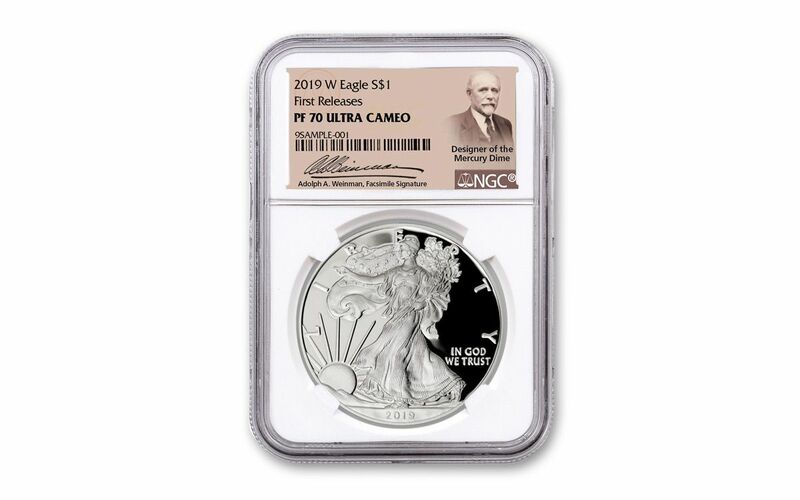 Whether you're new to the series, a diehard collector or a silver stacker looking to add to your reserve, this is your chance to secure these 2019 Silver Eagles in perfect Proof-70 First Releases condition for your very own. Don't wait – order yours today!